Any tips on feminizing a wheelchair? I recently had to buy a wheelchair. Hopefully I won't need it for long and I'll be able to put it into storage and not have to bring it out again until I'm 80, but since I have to use it now I want to customize it to make it my own. 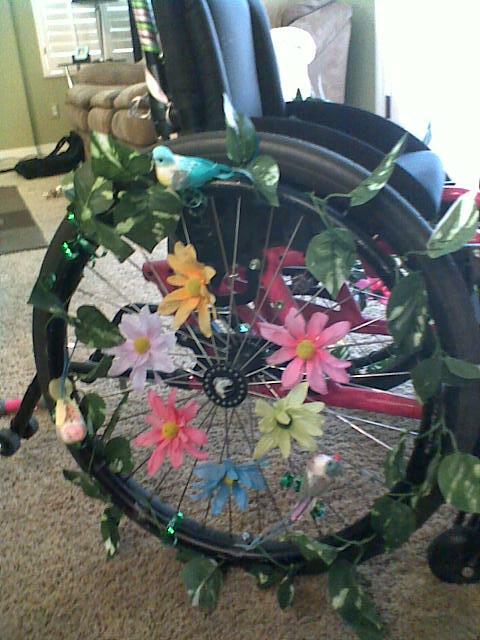 I figure since I'm going to be seen in it every time I leave the house I might as well give it some personality instead of the bland Equate wheelchairs Walmart sells. It's just your basic black. A few chrome elements, but for the most part it's solid black. I've been stuck with masculine and gender neutral stuff my entire life, so when I customize something I make it as girly as I can. I've seen pink frames before but that's not an option. I needed it immediately and didn't have time to shop around so I went with what I could get at the time. I can't exchange it because Walmart only sells black ones. My first thought was to change the upholstery, but I did some looking into it. All I can find for manual wheelchairs is black. I found some pink upholstery, but it's for an electric wheelchair and nearly $70, far more than I want to spend on something that will hopefully go into storage soon. That rules out the biggest change. I guess I could pull the Equate sticker off of it and put on some girly stickers, but while we're starting to see adult coloring books now, stickers still seem to be the domain of little kids other than bumper stickers, and I think being a fat chick rolling through a store or down a sidewalk with bumper stickers would leave me open to a few jokes at my expense. Basically I want to change its appearance to the point that if someone sees it sitting empty they'll say to themselves "that chair belongs to a woman." Unfortunately the most obvious change seems to be too expensive for me. Anyone here have any ideas? If it helps with shopping (can't tell you how annoying it is to have to balance things on your legs while wheeling yourself around the store) it would be a big bonus. Re: Any tips on feminizing a wheelchair? Thrift store scarves can be tied onto and wound around and makes bows n stuff. And it won't necessarily impede the function of the wheel chair. It can be gaudy if done wrong, but I'd suggest rhinestones. Although personally, I'd just buy a decal of a cool female character from a TV show or something that I like and stick it on the back. Yes good ideas, and get coloured tape to wrap around bits. And colours of that spongey handle tape for the handles from a bicycle shop?